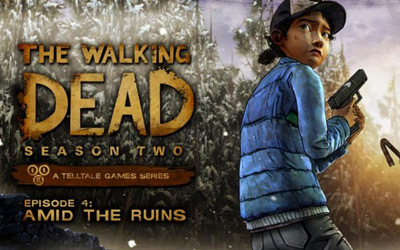 If you’ve ever played another Telltale Games title, you already know what you’re in for with The Walking Dead Season Two: Amid the Ruins. What’s on the menu is an amazing penultimate episode with some amazing storytelling that tugs on the heartstrings of players and builds up to the story’s ultimate ending episode. Playing through it for the first time, you will experience some twists and turns that will shock and awe you. There were times after seeing how a decision I made played out where I literally thought about restarting to see if I could avoid the same outcome. It makes the game so much more meaningful when you feel like your decisions cause what follows, and this game takes advantage of that immensely in this episode. If you haven’t played through the game yet and want to avoid spoilers, please stop reading now. You’ve been warned! Starting where the third episode left off, the player is immediately thrust back into the role of Clementine as she and her group attempt to walk past a horde of walkers that are invading Carver’s camp. Dressing themselves in zombie guts like they have in earlier episodes and seasons, the characters think this will be a surefire victory yet again. They were wrong. As the last episode came to an end, you were forced with a split-second decision to sever Sarita’s hand after she’s been bitten, or to attack the zombie instead. Your choice is the first thing you see when this episode starts. I’m not sure how you’ve handled things, but I went for the hand. It didn’t work out however, and it made me wonder if I could have saved her by attacking the zombie first and then severing her hand. If you cut her hand off instead of saving her, she falls back in terror and shock and is eaten by several walkers. Bad choices can’t even escape me in games! You delve into the character’s emotional states as they each deal with what’s going on. Kenny is taking it the worst, having just lost his girlfriend to the horde, but the others all have their own struggles they are coping with as well. As the episode progresses, we meet up with each of the previous group’s survivors and deal with their issues as well. Sarah is dealing with the loss of her father, Carlos, in a very bad way. She can’t pull herself together and almost dies when she freezes in fear as the walkers break through the door to get to them. I was able to save Sarah at this point, but she nearly gets Clem killed in the process. This idea of leaving the weak behind was first presented when we learned more about Jane. We find out that her younger sister gave up and lost the will to live, and she was forced to leave her behind in order to survive herself. This collided with my treatment of Sarah, even until the end where you see that Jane was right (or my version of Clementine did, at least). Without ruining too much more of the story for the curious souls that have yet to play but are still reading this, you are thrust into an action filled situation where you have to choose to let Sarah die or force Jane to save her. The outcome, for me at least, was heartbreaking and shocking, and helped end the episode on a high note. More than ever however, the cliffhanger at the end was what had me amazed. While you were off with Jane finding a safe spot for Rebecca to give birth, you come across a guy with a bag of medicine. He tells you it’s for his sick sister, and you are given the option to steal the medicine for Rebecca or let him go with them. Trying to save Rebecca’s life, I decided to take the medicine and he runs off. Once the episode feels like it’s ready to end, it shows your group walking off into the distance to get to the next location. In the road up ahead, you see the man you stole from (or didn’t, if that was your choice) limping toward you. As a confrontation ensues, his group jumps from the bushes and surrounds your group. Something crazy happens and then you have to choose what to do. I don’t believe I chose right, did you?